We were at the Marriott last Friday for our Menu Tasting which was incredible. 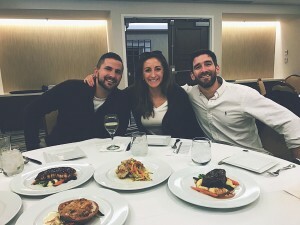 My brother, Ryan, joined us as were allowed to bring guests and we thought his advice on the menu decision would be helpful. The food was delicious!! The Marriott’s ballroom was a “hard hat” construction zone this visit, however we did get to see the vision board of the design. It looks beautiful! The ballroom is scheduled to be done by January 26th; we will be making another trip to Newport to see the final product!! Our wedding will be a formal plated dinner and we chose stuffed chicken, salmon, and vegetarian dishes. We are also really excited about the bacon wrapped scallops and lobster salad that will be passed around during cocktail hour. YUM! Pending the approval of the City of Newport, we just booked out transportation for guests to and from King Park and also will be booking the transportation for the wedding party this week! Brian and I want our wedding day to be romantic and classy with a beachy vibe. Now that we met with florists, we have a better understanding of how flowers make the wedding day even more magical. Honestly, from the beginning, I have not been focused on flowers until I began meeting with florists. My mother joined me for the meetings because Brian was not overly enthused about flowers. My color palette is soft yellow, pale pink and white with maybe a few blueish succulents and some dusty miller as well. I think our flower choice will go wonderfully with our bridesmaids’ dresses! 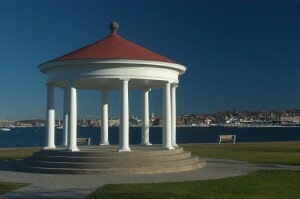 Will hopefully be (fingers crossed) at the King Park gazebo in Newport and will not need a lot of flowers since it is outdoors. I won’t give too much away but there will be some simple flowers at the ceremony. We are using the Marriott’s ballroom as our reception site, which is currently undergoing renovation and I am so anxious to see the results!! The colors that the Marriott interior designers chose are beautiful and will complement our theme. It has been very difficult to stay within budget for the flowers because there are other parts of our wedding that we allocated more money to… but we were able to make it work with the florist! In addition to the bouquets, our grandmothers will have classic and simple corsages and all of the men will wear traditional boutonnieres. We love Newport because we’ve spent many Forth of Julys here and it also reminds us of where we could have almost met a thousand times (since we both went to RWU). But we didn’t think Newport would be in our price range. We were pleasantly surprised with we found Newport Marriott. I’ll never forget Brian’s face when we walked in and he saw the venue. He looked at me like “there’s no way we can afford this!” But once we looked at our budget and their package pricing, we knew we were sold. We sent out our save-the-dates card mid-October. All the books, blogs, and websites we’ve read said to wait to send them out between 6-8 months before the wedding. We designed ours on minted.com. The website was simple, inexpensive and made the process stress-free for both Brian and me. I do have some advice–make sure the font you choose is clear. After we ordered, we realized the font for our wedding website was small. My mom said she had to use a magnifying glass just to read it — OOPS! We both chose seven attendants each for our wedding party, including Brian’s sister, my brother and brother’s girlfriend. One of Brian’s groomsmen will also be officiating our wedding! 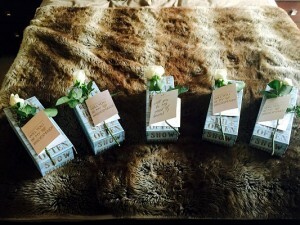 We had a joint night where we invited everyone over and asked them to be in our special day with small gifts. Brian put together a bag with a nip of their favorite liquor and ​a cigar for his groomsmen. I filled a box with a framed picture of myself with the bridesmaid, a small bottle of prosecco and Jordan Almonds as a joke from my favorite movie Bridesmaids. I topped it off with “Will you be my Bridesmaid” cards and a rose. We like the variety a DJ can bring to a wedding. Some people may cringe when they read this but we interviewed ONLY ONE DJ, Bill from Rhythm Express Disc Jockey Service Inc., and booked him, because he was personable, flexible, located in Bristol and experienced with our venue. I am happy I did! Music is very important to us and Bill was agreeable to taking our ideas and playing our preferences. My advice: don’t over think it! If the DJ is experienced and friendly, I’m sure that will reflect in his performance. After looking online at several stores, I decided to go with David’s Bridal. 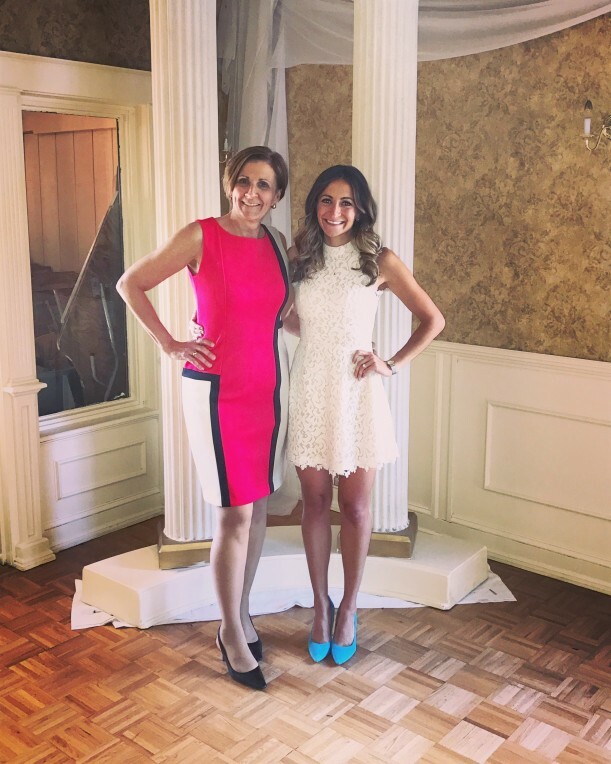 I’ve also worn their dresses in several of my friends’ weddings and have liked my experience with them. There are so many options and colors, but I knew I wanted the color gray. It was just a matter of choosing the right shade and style. I liked the idea of my bridesmaids wearing a style that had some detail that was similar to my dress, i.e. neckline, back, cut, etc. I wont go into specifics about what we went with but I think all the girls fell in love with the same dress I liked. I really wanted them to be comfortable so I took them with me along with my mother, whose opinion means the most. We need to pick our florist and figure out some of the smaller details like accent colors. Brian also needs to go find his tux! 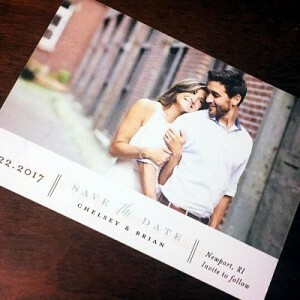 Boston couple Chelsey Spencer & Brian William Woods will wed on April 22, 2017 in Newport! I grew up in Franklin, MA and Brian grew up in Lexington, MA. We “officially met” on Match.com. 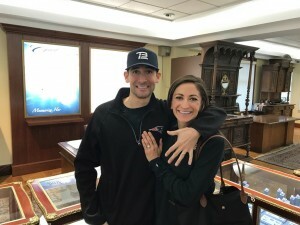 However, moments before the first date, I knew there was something familiar about Brian and thought he may have gone to Roger Williams University, where I went. During our first date we realized that we had crossed paths hundreds of times at parties and on campus but had never been formally introduced. Our second date was the following night and the rest is history! The day after Christmas, as we were getting ready to leave our apartment for dinner, Brian hit the elevator to go up instead of down. When I questioned him, Brian explained that he did something “Christmasy” on the roof that he wanted to show me–he had decorated the entire deck with lights! Brian positioned me right in front of the Boston Skyline and got down on one knee and asked me to marry him. Little did I know that Brian’s cousin, Meg Belanger, who happens to be a professional photographer, was hiding on the roof documenting the whole proposal! When we went down to the lobby where Brian’s parents and my family surprised me. I was in for another surprise when we entered our apartment complex’s common room. There, 50+ of our closets family and friends waiting with food, drinks and decorations. It was an amazing opportunity to share the moment with everyone. We have two dogs. Chandler Bing is a Papillon and Waffles is an English bulldog. We chose Pizzuti Photography thanks to Brian’s cousin. We really wanted Meg to enjoy attending our wedding instead of being behind the camera. Rich Pizzuti happens to be one of Meg’s closest friends and colleagues. We loved the vibrancy and clarity of his photos and felt like they were timeless. We chatted with him over the phone and loved his personality. My biggest piece of advice when choosing is to ask every photographer to send you some albums of recent weddings they have done that are similar to the venue, location and season that you will be having. This helped us with our selection!! 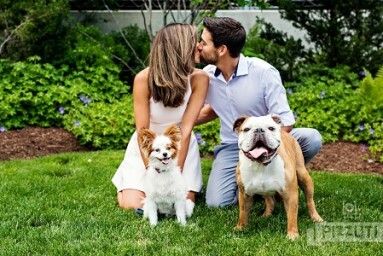 We chose to do our engagement shoot outside our apartment complex with the pups and then in the North End. 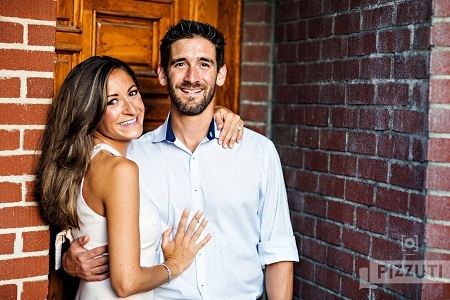 We chose the North End because we had our first date there and we frequently go there for Italian food, drinks and cannolis! 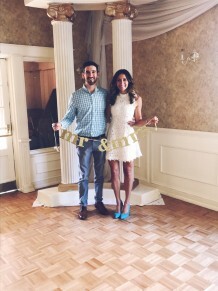 Our wedding party, Save the Date cards and venue selection!